Not Register Your Mobile Number deactivate Account | Deadline for SBI customers on 30th Nov 2018 : Mobile number not registered? SBI will deactivate online banking access from next month (1st December 2018). How to register and update mobile number with your SBI savings account, How can I register my mobile number in my SBI account? How can I register my SBI account by SMS ID? State Bank of India's largest lender State Bank of India (SBI) has imposed a deadline for its clients. SBI customers have announced that it will stop the online service if the mobile number is not connected to the account by November 30. How can I check my SBI net banking mobile number? How can I register for SBI net banking? The SBI website has published a statement on this. 'Please register your mobile number by November 30, 2018. Otherwise internet banking services will be discontinued. It will come into effect from December 1, 2018, "SBI said. The Reserve Bank of India has issued a mandate to all the banks to connect the mobile number to the account so that the customer can disclose the details of his transaction. SBI also sent a message to its clients. Those who wish to register the mobile number will have to contact the relevant bank branch. SBI has also provided a facility to register mobile number via ATM. ATM card should be selected on the machine after selecting the registration option. ATM PIN must be entered. Select Mobile Number Registration Option. Enter the mobile number and press the 'Correct' option. Enter the mobile number once again for verification. A message comes from thank you for registering your mobile number. Within three days the customer comes with a message of reference id. 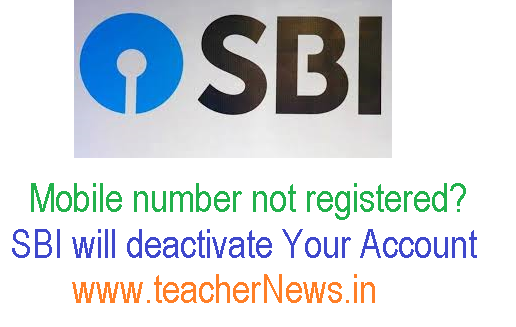 Deadline for SBI customers Not Register Your Mobile Number deactivate Account, How to Register Mobile Number in SBI Account, SBI ATM Online Mobile Number Registration in SBI Account.